As soon as possible after we learned Alex had down syndrome we began our research. We did not know anything at all about down syndrome, and we were terrified. I recognize now that this was one of the many factors that moved us out of our grieving phase. The more we learned the more I realized our lives would be fine, just like everyone else’s, only different. The research phase is life-long. In 1993 we did not have a very robust internet so we resorted to more traditional forms of knowledge; books and people! As much as I love the internet I still believe there is nothing more important to a new parent with a child with special needs than a face to face or phone conversation; it provided an interactive and open forum that I have not found anywhere, except perhaps in the blog community. When Alex was born, I was not able to "surf" the web to find reference materials on an as needed basis. Today, if I need information I can find it instantly. However, my mind does not work so well with bytes of knowledge. 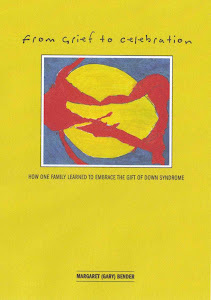 I still enjoy books, and often go back to my down syndrome library acquired over the years. Following is a list of the books I enjoyed. I also enjoyed a couple of inspirational books. I know there are now many more available; I really should update my library. 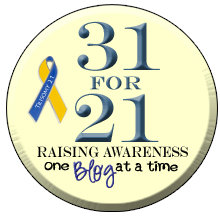 I do need to recognize so many of the support groups, down syndrome sites and the blog community. There are so many resources available in cyberspace; a simple google search brings up hundreds of links to information. Search for a local support group, national/international information sources and follow some of the blogs. These newer tools will supplement all the learnings that are possible. This is a powerful topic that really resonates with many people. I was certainly touched. Thanks so much for posting. I look forward to learning more. As the comment shows up above, inspiration never dates.